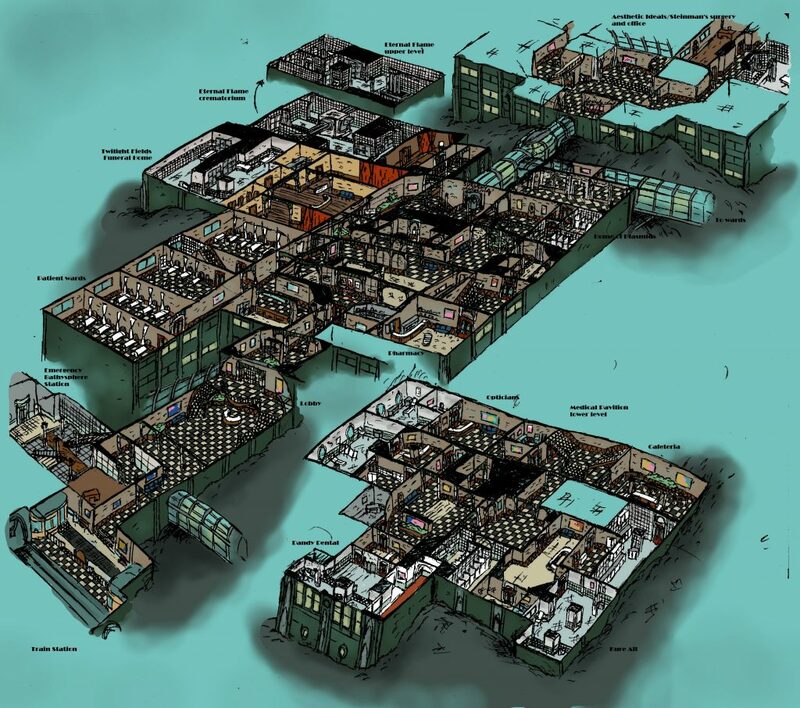 A Beginner’s Guide To Crafting Video Game Cities. From the underwater, art deco wonders of Rapture (2K Boston, 2K Australia, 2007) to the oppressive urban environments of City 17 (Valve, 2004), cities are far too common a setting in modern videogaming. Then again, they also happen to be a commonplace backdrop of contemporary everyday life, incredibly rich hubs of a myriad human interactions, and thus also the birthplaces of most of our modern art. Cities, history’s unparalleled centers of human creativity and drama, are the places where the majority of us actually live, work, love, create, dream, and occasionally kill each other; they simply have to serve as the imaginary settings for our sporadic conjuring of mythical entities as well. Cities are sources of constant inspiration, and with 54 per cent of the world’s population already residing in urban areas (United Nations, 2014), and the accelerating rates of global urbanization, one should expect them to play an ever increasing role in the ways we, an urbanized species, shape our culture. Of course all art is not the same, and each medium is bound to take differing approaches when tackling urbanism, but we would be wise to admit that, generally, games rarely do cities right. At the moment iconic, unique, and immersive as both Rapture and City 17 might be, they are two essentially rare exceptions to the prevalent non-immersive game city. Immersion, you see, an elusive and much sought after quality of game worlds, demands believability, and believability in the case of cities is never easy to achieve. Excellent art design, exciting levels, and even clever architecture are not enough. A city, no matter how exotic it might have to be, can only be believable if it makes sense. If it feels real and complex enough to fulfill the many expectations of experienced city dwellers. City 17 – Strider Patrol. Cities, as most types of settlements, are rarely done right in games by failing to feel real; not by failing to be imaginative. Supposedly sprawling metropolises are presented as little more than simplistic towns trying to pass for stereotypical CBDs, garages able to house hundreds of cars are found underneath small villages, fantasy cities sport inns-to-houses ratios of 1:2, buildings in medieval settlements look absolutely identical to each other, everyday life is commonly reduced to repeating animatronics-inspired scenes, roads are too wide, vehicular traffic too obviously scripted if not entirely forgotten, and, sadly but frequently, things simply fail to feel right. Getting comfortable with the basics of urban planning and the geography of cities, while finding cost effective ways of conveying a city’s richness and complexity, though a wise way towards crafting believable urban environments, can admittedly be both difficult and time-consuming work. It is no wonder then that cities are often treated as mere backdrops. As lifeless, boring yet beautiful backgrounds lacking any sense function, and thus failing to convey any meaningful civic illusion. It is not uncommon for such one-dimensional environments to be the product of overtly simplistic approaches. Settlements are often, and wrongly, seen as mere sums of arranged buildings, imagined as essentially homogenous, approached as creations of pure architecture, or even as formations simple enough to be fully captured via a rudimentary road plan or an evocative piece of concept art. In reality though, cities can neither be understood nor designed as elaborate building complexes and extensive mood pieces. In order to become the complex, beautiful, dynamic, and very exciting formations that they should be, imaginary, interactive cities have to first and foremost be cities. That is, they must enable and embody all the functions that can make them urban. So, even if all you need to show are a few facades, a small hub, or a couple of 3D neighborhoods, you have to at least vaguely have a full, functioning city in mind. Something as simple as a rough sketch on paper should be better than nothing, provided certain basics like the economy are in place. Knowing that a particular set piece is taking place in, say, a suburban cul-de-sac of an average sized US city in the Midwest with breathtaking mountain views, a religious population, and a rich history in mining during the 1970s, is much more effective than simply using the average, stereotypical, and bland cul-de-sac in your creation. Inevitably the question that now arises is the one considering the actual crafting of a rudimentary city. What should you have in mind? What should you aim to sketch, describe, and populate on paper before jumping into level design, and the creation of your neighborhood hang-outs or street level concept art? What, in a nutshell, are the very basic aspects of your city? What are cities? There are dozens of definitions I could provide you with in order to answer that last question, and they would all have to be at least partly lacking, and simultaneously mostly correct. But, getting too technical, and opening theoretical cans of worms is never a good idea. What you actually have to keep in mind when designing a city is that its functions — what it does and facilitates — are paramount. They are the backbone on which its form and structure are based. According to Max Weber (Weber, 2003: 53) it is, after all, not its size that differentiates a city from a village, but its functions. They are effectively the spatial expression of economical and social reality, and are the forces around which the urban environment is shaped. To provide you with an example, the crucial urban functions of a contemporary city would be commerce, production, the circulation of capital, housing, human reproduction, transportation, employment, innovation, and even culture and ideology. It is these functions that dynamically change throughout history, and help settlements evolve into new urban forms; that make cities what they are. Of course, certain core urban functions, those that define all cities throughout history as cities, never really change. All cities, real and imaginary, ancient and future, are their people, their economy, their buildings, their infrastructure, their roads, their habits, their history, their architecture, their climate, their topography, their stories, and their art. They are also a myriad of other things such as their sky, idioms, smells, colors, customs, and street furniture (if any), but more importantly they are always and without exception works in progress, dynamic, and internally differentiated. Being the results of complicated histories, and homes to a huge variety of people means that the energies within a city never rest. Oh, and as Bulmenfeld (1972) wisely noted, the importance and multitude of human interactions within each urban center simply cannot be overstated. What’s more, due to each city being an essentially unique creation, each one will have to showcase its very own distinct feel and logic (with the notable exceptions of repeatable formations such as military or company towns), as well as a selection of elements such as distinct materials or unique sorts of neighborhoods. Obviously, most videogame cities do tend to either ignore such realities, or tackle them haphazardly. Then again, many game cities do miss much more obvious things than these. It is, for instance, frequent for them to lack an elevation map or any sort of topography, public spaces, a ranked road and transportation network, well thought-out streets and vehicles, evidence of a functioning infrastructure, something resembling a sensible city life, street furniture, realistically planned land uses, crucial activities, in-game functions showcasing the organization of space, buildings under construction and of various ages, mundane images of everyday life, or flora and fauna. Such omissions are mostly due to approaching cities in the wrong way, and not necessarily a result of limited resources and time. Even when attempting to create a town with a single and overbearingly dominant function, a holy city for example, one of the simpler urban formations in real life, things can easily go wrong when approached without a plan. When holy cities, historically impressive creations of “times [when religion] has been the supreme function of a great city” (Lynch, 1984:142), are treated as glorified shrines they are bound to be missing crucial elements. The significance of the place, especially to its intended virtual users, and the ways a modestly sized settlement could be a symbol of religious values, social structures, and the nature of the universe, have to be taken into account instead. They can never be ignored or overtly abstracted, and the core function can only shine when its supporting ones are given the care they deserve. Instead of starting by building an exquisitely complex system of temples, designers should ask themselves questions regarding the sleeping arrangements of pilgrims, the feeding of the city, the non-religious aspects of its economy, the dress-codes of the devout, the organization of marketplaces, the selling of offerings, and how things and people move around in it. Promotional image of Dishonored 2 (Arkane Studios, 2016) and the city Dunwall. How should a city, any city, be tackled? One approach would be, especially when an existing or historical urban formation is to be approached, to use its actual city plans and regional topography, and modify them according to our purposes, each other, and the medium. Sometimes an existing place could also serve as inspiration for an utterly imaginary one. 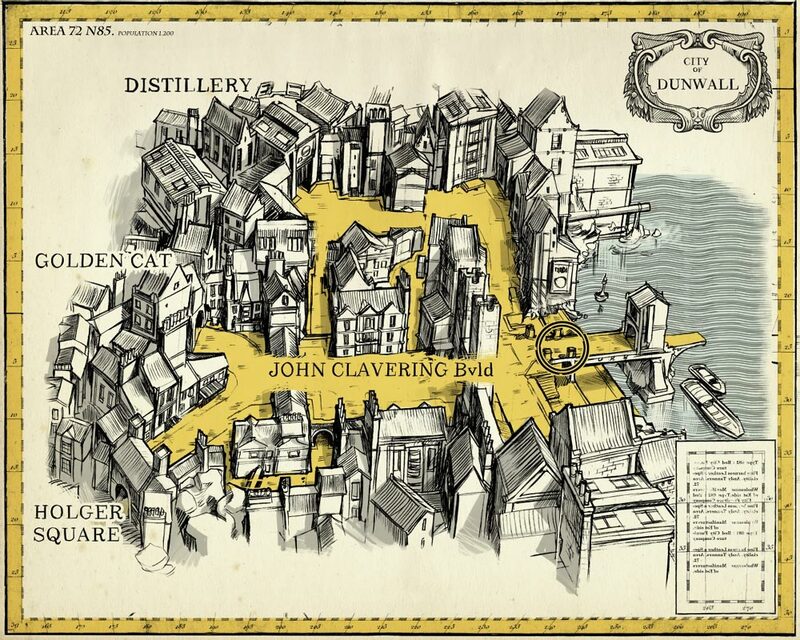 Famous fantasy capital Ankh-Morpork (Terry Pratchett, 2006), for example, is mainly based on Tallinn and central Prague, but also employs elements of 18th-century London, 19th-century Seattle, and 20th century New York. Even if the choice is made to begin designing a game city based on a real location, its creation should always start off by the designer answering a set of questions. First of all, where is the city? As Lefebvre (2006: 83), wisely put it, “the raw material from which space is produced is nature”, and that is exactly why the natural environs, topography, and the location of a city are an important decision. They will have to be carefully considered, and they should influence the lore behind the city’s founding. They will indeed serve as our raw material basis. Probably even define the materials used in the city’s architecture; ancient Athens’ extensive use of marble wasn’t merely the result of a taste for white stone, you see, but the result of the abundance of the material in nearby mountains. Initial placement of a city could of course be a given — Sherlock Holmes’ London will have to remain in the wider region of actual London — though the need to conjure its location out of thin air could easily arise. In this case, the overall geography could be randomly/procedurally generated, imagined, or base itself on an appropriately modified existing location. One could use French Polynesia as a starting archipelago, and add, subtract, change, and re-purpose islands in order to construct one’s oceanic megacity. Not unlike the interconnected sci-fi islands of an urbanized archipelago, a steep mountain can be profound, and full of character. As can a deep lake, or two peaks separated by a picturesque canyon. A natural harbour, on the other hand, would also dramatically impact the local urban economy, and thus possibly define a city’s history to quite an extent. Location, you see, is not only about the natural environment. It is about its societal formations too, as well as the interplays of the wider geography. The proximity of your city to other towns, cities, resources, hubs, nations, and rich forests can thoroughly influence it. After a location has been picked or crafted, the matter of when must be settled. Where and when strongly influence a city’s functions and history; urban form and structure are produced by said functions, and shaped and detailed by a place’s history. Keep in mind that determining size, the immediate next step, will also be crucial. A town and a metropolis simply do not behave or look the same way. The first question is “where”, and as creating something more original is always more entertaining, let’s place the city in Norway, where, among other things, it’s bound to earn a very interesting name too. The next question, “when”, I’d answer by choosing the 19th century, which would allow for many elements of modernity, but also for darkened, isolated towns. When and where would also guide me when tackling the topography issue. Norway’s stunning coasts and fjords are too dramatic a setting to ignore, and, especially during the dark winter, perfect for fostering isolation, darkness and horror. Now, how big should this 19th century fjord town be? Not very actually, as a modestly sized settlement would make sense both historically and geographically. It would also be less expensive to construct assets-wise, yet still offer enough variation and provide with adequate space to play in. As for the town’s functions, it would firstly have to provide housing for its residents (residence), rudimentary roads for them to move around (transport), and jobs (economy). Structuring the place around fishing should work well, and would also provide us — after some research — with a ton of intriguing bits of applicable fishing history (and legends). The city’s functions would then have to include everything around the fishing industry (long range transportation, storage, retail and wholesale, logistics, boat repairs, fishing supplies, actual fishing, etc), and all the key functions of the 19th century European city, including a town hall, a hospital, probably some public spaces, but most definitely not a football stadium. Add to this hints of 800 years of layered history beginning from the Viking era of half-forgotten ancestral shrines and the first stone temples, to the more modern harbor expansions of the 18th century, and those contemporary, properly capitalist factories of canned fish meat, and you’ve already got a solid foundation for a vibrant city. Using said foundation, coming up with districts, specific places, and sub-areas of the city that feel right shouldn’t be too difficult, and neither should imagining the general structure, form, and organization of the whole settlement. An older section of cramped, dilapidated stone-and-timber buildings where the poorer fishermen and factory workers live near the harbor would be instantly conjured. Close by, one can assume, would be an industrial area, the train connecting it to the harbor probably passing through said poorer district. More affluent residents would probably prefer mansions by the waterfront, or at the town’s still rural suburbs. Vehicles, people, trees, urban furniture, garbage, abandoned stuff, city utilities, newspaper offices, bus stations, telephone centers, railway stations, sanitariums, public libraries, courthouses, police departments, jails, shops, taverns, clubs, hotels, graveyards, national guard armories, post offices, speakeasies, banks, squares, roads, corporations, offices, telegraph and telephone lines, hospitals, schools, factories, houses, villas, roads, secret societies, libraries, and theaters. Not forgetting such elements can work wonders, but what really matters is the understanding that everything embedded in space, be it a harbor, an old crumbling church, or even a Norse monument, has been constructed on its particular place for a purpose. Always keep in mind that whether it is the will of a planning authority, a guild, a family, a real estate developer, a club, a god, or even an insignificant individual, each and every element of the urban space exists for a reason. It has essentially been planned. Every building, every bench, every road, every bridge, every house, every facade, every arcade has a purpose, and has been built in an attempt to achieve it and satisfy a need. Said purpose may not be instantly (or at all) discernible to all, and may have over the course of history been lost, thus allowing the original building to evolve into something else entirely (old downtown factories are commonly turned into livable lofts), but it originally was there. For your very own, very interactive imaginary city to feel real, believable, and immersive, you really do have to design it with this simple truth in mind: things have to make sense. La música y el videojuego absolutos. Hitman y el crimen como experiencia espacial.